Cook pasta as directed on package, adding broccoli and bell pepper for last 2 minutes of cooking. Drain; return to saucepan. Stir in chicken and Alfredo sauce. Cook over low heat about 4 minutes, stirring occasionally, until chicken and sauce are hot. Sprinkle with cheese. 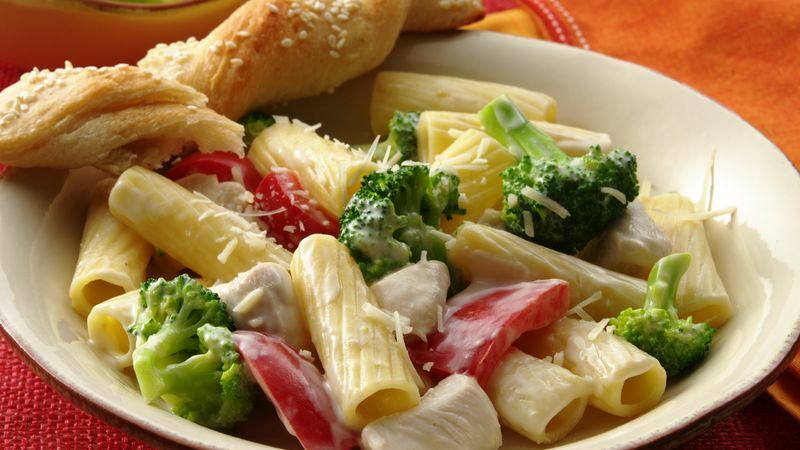 Any tubular-shaped pasta, such as penne or ziti, will work fine in this dish, and, to make it vegetarian, just omit the chicken and increase the broccoli to 3 cups.